A special stamp designed by a Vietnamese artist will be issued in the 10 ASEAN nations to celebrate the formation of the ASEAN Community later this year. 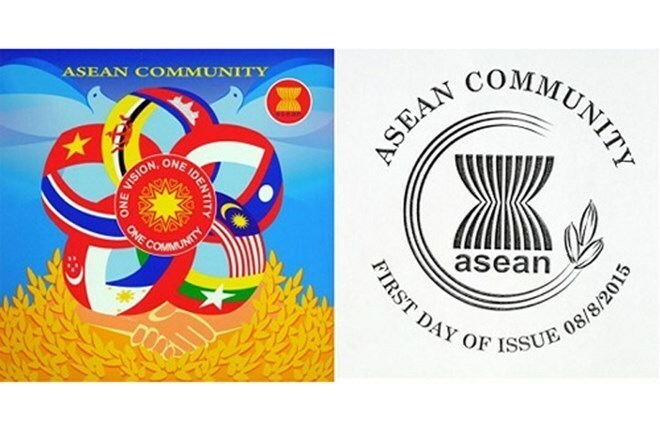 A competition was launched earlier this year for stamp designs that reflect the motto “One Vision, One Identity, One Community” of the 10-member Association of South East Asian Nations (ASEAN). It took Vu Kim Lien of the Vietnam Post Corporation (Vietnam Post) six months to create her winning stamp, which depicts the 10 ASEAN member nations’ flags arranged in the shape of a five-petal flower. The flower is suspended on two hands shaking, representing cooperation and friendship against the background of a pile of yellow rice, representing the region’s wet rice agriculture. The stamp also features two doves – symbols of peace and stability. Hundreds of entries were submitted from all over the region, with Lien’s design selected as the winner out of 30 submissions in the final round. Ngo Hoai Thanh, deputy head of the postage stamp department, said this first prize was not only hugely significant for the artist, but also for the Vietnam Post, noting that this was the first time staff members had won a big prize at an international stamp contest and a stamp with the corporation’s design would be issued region-wide. In addition to the aforementioned stamp, Vietnam also won the first prize for its ASEAN postmark design, with the work by another Vietnam Post artist, Nguyen Du. The special stamp using Lien’s design has been printed already in all ASEAN member countries and will be published on the occasion of the 48th anniversary of the formation of ASEAN (August 8, 1967). The stamp is scheduled to be issued in Vietnam on August 7. Thanh said the joint stamp issue was expected to help promote the awareness about the role of the ASEAN among agencies, organisations and citizens in member countries, as well as promoting the active participation of members in cultural, educational, tourism-based and economic exchanges.